After World War 2, the USAF wanted a new assault glider to replace the obsolete gliders used during the war. Chase Aircraft designed the XCG-20 which was to be the largest US-made glider ever produced. Two powered examples were developed, the XC-123 powered by two radial engines, and the XC-123A powered by four J47 turbojet engines. When Henry Kaiser took over Chase Aircraft, the company was stripped of its C-123 contract after a pricing scandal and Fairchild Aircraft took over production. The C-123B was main production variant which saw service in Vietnam as well as with the US Coast Guard. In the early 1960s, the USAF upgraded over half of the C-123 fleet to the C-123K configuration which included the addition of two auxiliary jet engines in underwing pods and anti-skid brakes. By 1979, the Royal Thai Air Force wanted to extend the life of their C-123s and issued a contract to re-engine the aircraft with a pair of Allison T56 turboprop engines as the C-123T, but budgetary problems led to the cancellation of the program though one example was built. The C-123 is the only aircraft in the world that would be developed as a glider as well as powered by piston, turboprop, and turbine engines. 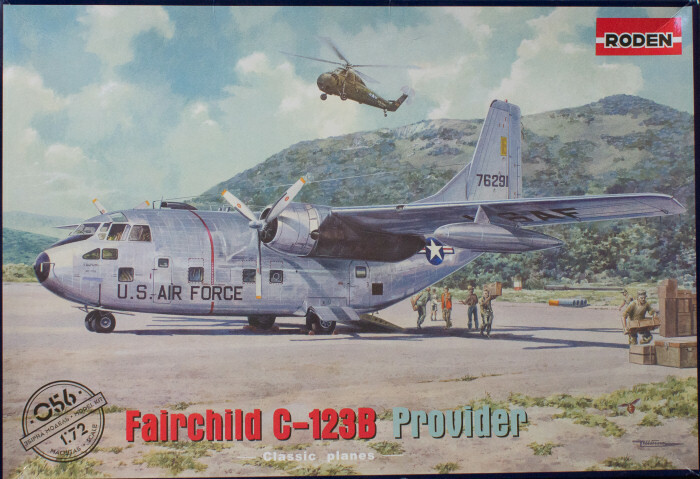 There was much excitement when Roden announced the development of the C-123 Provider in 1/72 scale. This is a subject that has been overlooked for some time in this scale and it looks like the wait was worth it. This subject has been produced by Mach 2 in 1/72 scale (which wasn't much of an option) as well as in 1/144 scale by A Model. The interior of the cargo bay has some nice detailing from the wheel wells/wing main spar box aft. As you can see in the parts images, the fuselage halves have internal structural detail from the flight deck aft though you won't see much of it except through an open ramp/door. The detailed flight deck is nice though you won't see much once the model is completed because of the small windows (which are much clearer than the Mach 2 kit). You will have some ejector pin marks to clean up on the inside of the fuselage halves. One complaint I have with this kit and others from Roden is that they pack the clear parts in the same bag is the rest of the kit. I'll be buffing scrape and scratch marks out of my windscreen. And in case you're wondering, they don't include parts for future variants in this kit, so no jet pods, special mission noses, skis, etc., are in this box. The suggested retail price of this kit is around $70 USD in the US, but you'll find the kit for around $44 USD at good online retailers like Lucky Model or Hobbyterra.